Almási, Tibor (1994). "IV. 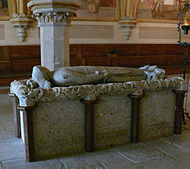 Béla; Gertrúd". In Kristó, Gyula; Engel, Pál; Makk, Ferenc (eds.). Korai magyar történeti lexikon (9–14. század) [Encyclopedia of the Early Hungarian History (9th–14th centuries)] (in Hungarian). Akadémiai Kiadó. pp. 92–93, 234. ISBN 963-05-6722-9. Bárány, Attila (2012). "The Expansion of the Kingdom of Hungary in the Middle Ages (1000–1490)". In Berend, Nóra (ed.). The Expansion of Central Europe in the Middle Ages. Ashgate Variorum. pp. 333–380. ISBN 978-1-4094-2245-7. Érszegi, Géza; Solymosi, László (1981). 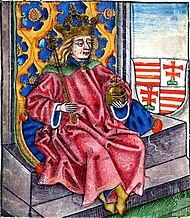 "Az Árpádok királysága, 1000–1301 [The Monarchy of the Árpáds, 1000–1301]". In Solymosi, László (ed.). Magyarország történeti kronológiája, I: a kezdetektől 1526-ig [Historical Chronology of Hungary, Volume I: From the Beginning to 1526] (in Hungarian). Akadémiai Kiadó. pp. 79–187. ISBN 963-05-2661-1. Makkai, László (1994a). "Transformation into a Western-type state, 1196–1301". In Sugar, Peter F.; Hanák, Péter; Frank, Tibor (eds.). A History of Hungary. Indiana University Press. pp. 23–33. ISBN 963-7081-01-1. Makkai, László (1994b). "The Emergence of the Estates (1172–1526)". In Köpeczi, Béla; Barta, Gábor; Bóna, István; Makkai, László; Szász, Zoltán; Borus, Judit (eds.). History of Transylvania. Akadémiai Kiadó. pp. 178–243. ISBN 963-05-6703-2. Sălăgean, Tudor (2005). "Regnum Transilvanum. The assertion of the Congregational Regime". In Pop, Ioan-Aurel; Nägler, Thomas (eds.). The History of Transylvania, Vol. I. (Until 1541). Romanian Cultural Institute (Center for Transylvanian Studies). pp. 233–246. ISBN 973-7784-00-6. Žemlička, Josef (2011). "The Realm of Přemysl Ottokar II and Wenceslas II". In Pánek, Jaroslav; Tůma, Oldřich (eds.). A History of the Czech Lands. Charles University in Prague. pp. 106–116. ISBN 978-80-246-1645-2.